The goal of the project is to develop methodologies for estimating the costs of continuous conservation tillage (CCT) with incomplete data and to use the methodologies to evaluate the costs of CCT –based carbon offsets in major U.S. agricultural regions. The project's specific objectives are to econometrically estimate models of CCT using the data available in the USDA/NASS- collected Agricultural and Resource Management Survey (ARMS), improve GIS-based, simulation models of farmers’ choices, develop maximum entropy-based approaches to estimation of CCT use models, and evaluate the costs of CCT –based carbon offsets in major U.S. crop production regions. The studies conducted under the project evaluated the availability and structure of tillage time series data in recent issues of ARMS, and developed and estimated data-appropriate CCT choice models. 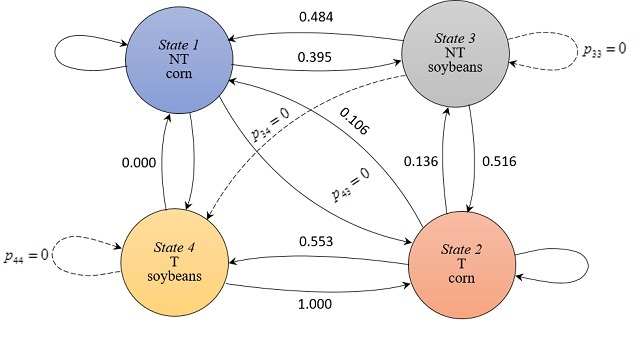 Additionally, maximum and cross-entropy methodology has been applied to the development of CCT use models operating on incomplete and/or aggregated tillage choice data. The project fills the gap in understanding of the dynamics of alternative tillage practices to stimulate the growth of the economically-sustainable use of CCT. The methodologies for estimation of the costs with incomplete data are expected to be relatively easily transferable to other environmentally benign farming practices. This research is partially funded by the USDA National Institute of Food and Agriculture, award No. 2016-67024-24755. The funding source has no involvement in the study design, data collection and analysis, or any other aspects of the research or paper publication. The views expressed in the publications and presentation generated by the project are those of the authors and do not necessarily reflect the views or policies of the USDA.